On my recent trip to the land of the great pharaohs, I discovered that some extraterrestrial evidence in Egypt is hidden in plain sight. About a two-hour drive outside Luxor is the Temple of Rameses II in Abydos. During its time, the temple housed the Melchizedek Mystery School where priests and priestesses were initiated into the ancient art of alchemy. As I walked through the temple, one’s direction is easily drawn to the many wonderful reliefs found on the tall columns and walls. But looking up to one particular ceiling beam I spotted unusual hieroglyphics that most visitors to the temple are completely unaware of. Symbols that will astonish you—like a modern-day helicopter, a submarine, and even a flying spaceship. A chunk of hieroglyphic information that was right next to the mysterious symbols is suspiciously missing (see picture). When I asked an Egyptologist about the unusual symbols, I was told that even the antiquities experts don’t know what it means and/or what to make of it. 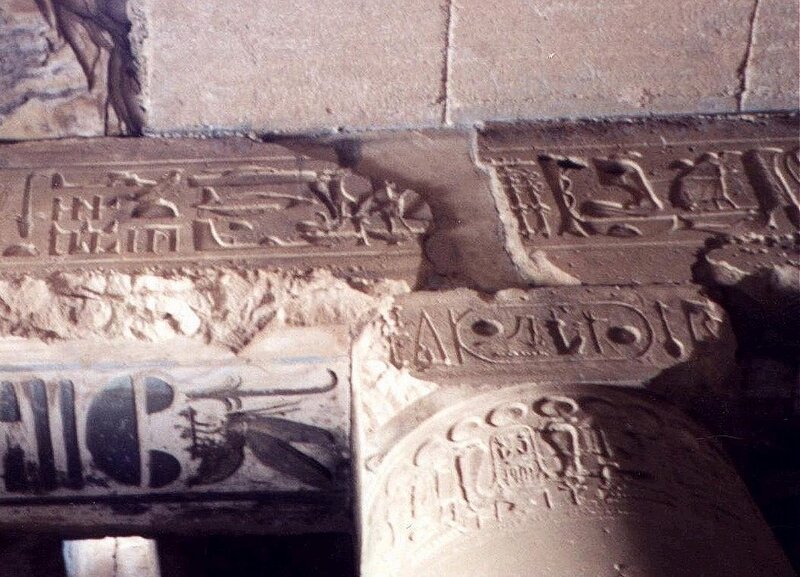 They have never seen these same symbols used in any other temple in Egypt. At least that’s the official story. One can only come to three possible conclusions: 1) The ancient Egyptians were being visited by extraterrestrials in spaceships; 2) they were being visited by time travelers from the future (our present time); or 3) the mystery school initiates could see into the future where such devices were being used. Then again it could be a combination of any of the above. One Egyptian insider I talked with told me that during the Tahir Square uprising in early 2011, that many of the students of Egyptology formed a human chain around the Cairo Museum to protect it from looting until the military could come and secure it. (Who could forget those stirring news images.) What we didn’t know was that the military headed directly to the 4th floor of the museum and quickly sealed it off. Artifacts stored there do not contain visible tracking numbers like all the rest of the museum’s treasures. The 4th floor is the mystery floor which is off-limits to the public and everyone else in Egypt but a chosen few. What’s kept there are the discoveries they don’t want anyone to know about and/or see. The mummified alien (5’ 3”) was found buried in an ancient pyramid by the archaeologist, Dr. Viktor Lubek near Lahun near Sakkara. It was discovered while exploring a small pyramid south of the Dynasty doceaba of Senusret II, which contains the queen of the pharaoh. This of course was not revealed immediately to the public either, and dates back to about 1880 B.C. 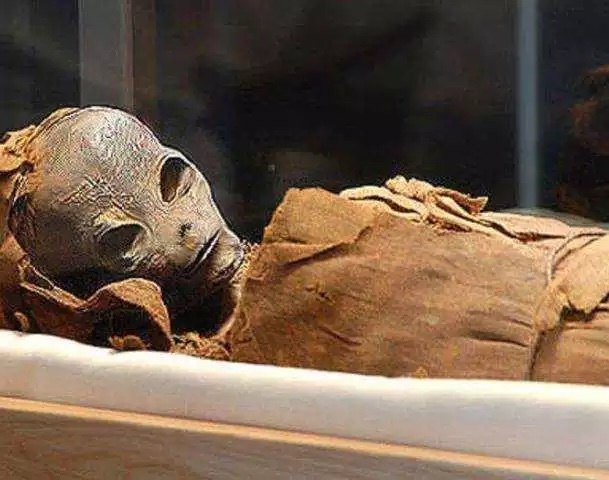 The anonymous person that provided this find’s details claimed that the discovery has caused great controversy among Egyptian officials, who want to keep it hidden until a “plausible explanation” for the strange mummy can be made. The Egyptian government has consulted a number of respected archaeologists, but to date none can explain the finding in ordinary terms. “The truth is that every expert who has seen the mummy has concluded that it is not of earthly origin,” said one source. “There is a sense that this is an alien who somehow ended up advising an Egyptian king.” But everyone in the government is moving away from that conclusion which would support the new ideas that the ancient Egyptians had help from aliens in building their extraordinary civilization. The Egyptians refuse to believe that their heritage came from outer space. It would re-write history books and our understanding of the world as we know it. Famous Egyptologists like the now deposed Antiquities Minister, Dr. Zahi Hawass (who was sentenced to prison for smuggling antiquities), found bizarre artifacts and disturbing tomb paintings and clamped down on the embarrassing finds with a tight lid of security. Any leaks that emerged concerning the discoveries were met with denials, derision, and sometimes veiled threats. These discoveries are said to be hidden away on the 4th floor of the Cairo Museum where other ET mummies are kept. (Those skilled in remote viewing should have a field day in this place.) Similar finds are claimed to be found in the British Royal Museum of Natural History. If true, the London curator and staff are not talking. In a shocking statement, the head of the Cairo University Archaeology Department, Dr Ala Shaheen (who is now the current Antiquities Minister) told an audience that there might be truth to the theory that aliens helped the Ancient Egyptians build the oldest of pyramids, the Pyramids of Giza. On being further questioned by Mr. Marek Novak, a delegate from Poland, as to whether the pyramid might still contain alien technology or even a UFO within its structure, Dr Shaheen was vague and replied, “I cannot confirm or deny this, but there is something inside the pyramid that is “not of this world.” Delegates to the conference on ancient Egyptian architecture were left shocked. However, Dr Shaheen has refused to comment further or elaborate on his UFO and alien-related statements. A stone’s throw away from the Abydos temple discoveries, in the town of Qena, one can explore the Temple of Dandara, built to the Goddess Hathor. The predominant cobalt blue colors on the columns and walls are incredibly beautiful and stunning. If you are able to bribe an Egyptian temple guard, you might also gain entrance to the underground Treasury where they once kept the gold and valuables. To get to it one must climb through a trap door in the floor, down a steep ladder, and then crawl through a very narrow opening to discover yet another hidden room with its own secrets. (If you are claustrophobic, don’t try this one.) Since I’m not, and my personal guide had an in with the guard, I got to take a closer look. The walls show pictures you will also not see anywhere else. Scenes of Egyptians using large cathode ray tubes for electrical lighting cover one wall area at the end of a narrow tunnel. One need only look around these temples to see that there is no smoke damage on the walls or ceilings from torches or fires. The temples that the Romans later occupied show some of this damage, but carbon dating shows it was not in existence during ancient times. Makes you wonder what else we don’t know about “ancient” times. Perhaps we might even find out someday that they were even more technologically advanced than even we could have imagined. The evidence is clearly there. Stay tuned for my next blog where I share what happened during my two-hour private time in the King and Queens’ Chambers in the early hours of the morning. I discovered some surprises there as well. Thank you SO much for sharing this Kathy, I have always had an intense interest in Egyptology and the incredible skills that the Egyptians employed (in a regression it was indicated that they had evolved from former Atlantean occupants under the guidance of Thoth). I truly believe that there is so much “hidden” and this has been fascinating to read. I know so many friends who have visited the area speak of a very tangible “energy” which can be felt. I look forward to your next blog and learning more. 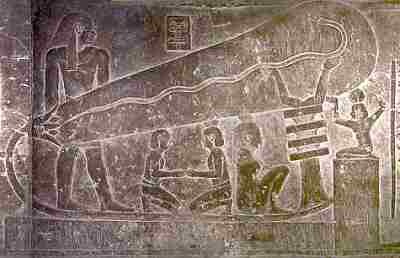 Very mystified by all things egyptian, love to discuss the endless possibilities of the Pyramids and a sundry. Thank you for the interesting read.